I woke up early today so that I could attend a John McCain, Sarah Palin rally at the Virginia Beach Convention Center. I wanted to get there as soon as I could because I knew there would be a lot of traffic associated with the event. Sure enough, the traffic headed towards the convention center was heavy but I managed to get there without too much trouble. After driving around a while in Virginia Beach I found a municipal parking lot about four blocks from the center. I joined hundreds of others who were walking to the center and ended up in a long line waiting to be screened by security before entering the center. The line moved quickly and we were entertained by some vendors and Obama supporters. Once inside it was about an hour wait before the program was to start. At my age standing up for several hours on a concrete floor is uncomfortable but I was determined to stay for the entire program. Promptly at 10 am the first of three local politicians, Thelma Drake, delivered the opening speech. She was followed by Randy Forbes and the Attorney General of Virginia. Next came a pleasant surprise as Hank Williams Jr. performed for the audience of about 25,000. He sang about 6 songs before introducing Sarah Palin, John McCain, and their spouses. The audience was wildly appreciative of all the speakers and the speeches themselves were very good. This was the first political rally I have ever attended and I enjoyed it a lot. I shot a lot of video as well as some still shots. 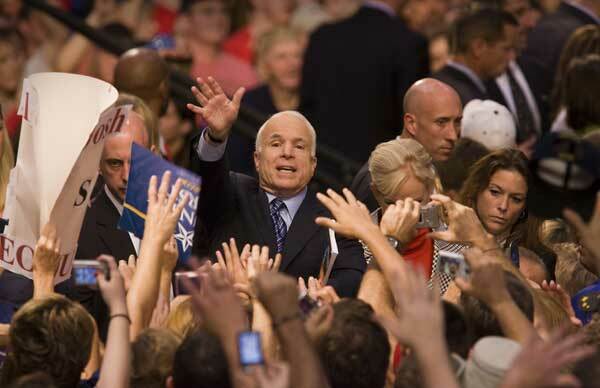 If McCain is elected President he will be the third President I have seen in person. It is really special to see in person the people who I have been reading and hearing about so much and who I will be voting for in November. This will be one of those days that I will remember for the rest of my life and was well worth the traffic and the standing for hours. Who knows, maybe after being so excited about this rally I may be motivated to travel to DC to see the inauguration in January. That’s it for now. ← Trip to Florida postponed.